As I write in Furin Kazan Plot 3, I post the episodes on the series after this for it gives a lively description of people, especially daimyos and their vassals in the Sengoku Period. I will keep posting the episodes of "Onna Joshu Naotora" and "Sanada Maru" also but I like "Furin Kazan" best. Recently Taiga Drama is said to become less attractive and the fictional parts are boring. Especially the series featuring female character tends to be so and there is another reason that several series are not based on novels as before. It stands to be reason that some viewers discuss how the present situation should be improved on the internet. Though Kansuke was ordered to spy on the Imagawas, he plans to take the side of BAIGAKU Hosho (later IMAGAWA Yoshimoto) to avenge the killing of Mitsu by TAKEDA Nobutora. Nobutora is going to support KUSHIMA Echizennokami, who assists GENKO Etan, opponent of Hosho in the dispute over succession. Kansuke meets Jukeini and tells her that the number of Kushima’s soldiers are limited and he will not invade into Sunpu but fight at Hanakura Castle, his base. But it means that he makes an enemy of his brother Sadahisa, vassal of Kushima. He tells his brother to betray Kushima when they happen to meet in front of their parents' graves, but he won't. At the same time, Nobutora meets TAIGEN Sessai, a priest and tutor of Shoho mediated by OYAMADA Nobuari, one of the senior vassals of Nobutora. There Sessai proposes to become reconciled and make alliance each other. In return, marriage of Harunobu and a daughter of the Sanjos, an aristcrat family in Kyoto whom Jukeini associates with is decided. Kushima and the vassals of the Imawgawas are in a state of war. The troops from the Hojo clan to support them arrive but the inforcements from Nobutora never appear. The Imagawas' soldiers rush into the castle. Though Kansuke attacks Etan and Kushima, Sadahisa makes them away. The brothers fight each other and at last Sadahisa tell Kansuke to help his suicide. He also tells his younger brother to survive and transfer the headship of the Yamamotos to him. Kansuke decides not to return to Kai any more. He hopes to serve the Imagawas, but new head who names himself IMAGAWA Yoshimoto after secularisation is told by Jukeini not to employ him. Kansuke also feels that Yoshimoto dislikes him during their conversation. Then he learns that the Takedas and the Imagawas were reconciled. And Kushima Echizennnokami, who is sheltered by MAEJIMA Masakatsu who serves Nobutora are executed by Nobuari but Hikojuro escapes from there. Some vassals of the Takedas blame the behaviour of Oyamada Nobuari (Seiichi Tanabe, centre) and surround him. Harunobu opposes his father Nobutora but he ridicules his son. After that, Lady Sanjo arrives at Kai accompanied by some maids includes Hagino. Their wedding ceremony is held and he hopes she will be an irreplaceable wife for his first battle is near. And Kansuke hears a news from a man called Aoki Daizen that there is a spy from the Uesugis called Honma Goshu in the hojo clan and hurries to Sagami, fief of the Hojos. Kansuke meets HOJO Ujiyasu and tells him about Honma Goshu. Goshu becomes confused but affirms the fact. It seems that Ujiyasu knows everything and tames Goshu. Ujiyasu wonders why Kansuke knows such a thing and suspects him to be a spy from the Imagawas. Though Kansuke denies it, one of the vassals of the Hojos who practice kendo finds him and insists that he's from the Imagawas. The man is KUSHIMA Hikojuro, son of Echizennnokami. "Plot of　Furin Kazan" will be changed into "Episode of Furin Kazan" from the next time. The images are from the video of the series. In the 16th century Japan, samurais, especially in higher ranks married a woman from the family on the same status for political reasons. And many of them had a few concubines to have many children however there were exceptions. A concubine could not have a wedding ceremony for she was thought not to be a wife but a maid. The ceremony of SANADA Nobushige in the episode 11 of "Sanada Maru" is a fiction. 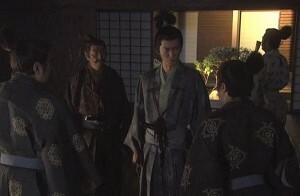 In the episode, Masayuki, father of Nobushige utilises it to execute his political enemy MUROGA Masatake. The heir of a samurai family was usually the eldest son of the head. If the eldest son was not from the head's wife, the first son born between the head and his wife was regarded as the heir. Brothers of the heir served him or adopted by other families. 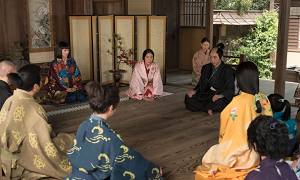 Naotora and her mother Yuchinni visits Ryotanji Temple where a girl who calls herself a daughter of Naochika stays. She who is called Takase tells them that she was born between Kamenojo (Naochika) from Ii-no-ya and Yuki, a local woman and her mother died. But nobody of the Iis knows that. Then she is about to leave but Naotora stops her to stay in her residence and decides to make an investigation of her. Natsu (Sayaka Yamaguchi, left) tells Masatsugu (Issei Takahashi) about Takase. It's hard to inquire into her origin and she doubts whether she is really a daughter of Naochika or not. She asks Nankei to ask about it to the Matsuokas, the family who sheltered Naochika when he stayed in Shinano. Shino learns about her from Toramatsu who saw Takase at Ryotanji and she meets Naotora. Shino says that she feels sorry for Naotora because her former fiance had a child with another woman with a suggestion of sarcasm. But Naotora ignores it. Natsu tells her brother-in-law ONO Tajimanokami Masatsugu about it. After that He warns Naotora that Takase is possibly a spy from the Takedas. Meanwhile TOKUGAWA Ieyasu is proposed to reconcile with IMAGAWA Ujizane but his vassal ISHIKAWA Kazumasa says that it's difficult to do it. And another vassal SAKAI Tadatsugu insists that the Imagawas are nothing but the enemies of the Tokugawas. Then Ieyasu calls MATSUSHITA Jokei to get the situation of the Iios whose head was killed by Ujizane. Naotora (Ko Shibasaki. right) accepts Takase (Hikaru Takahashi) as a member of the Iis. so alike. However she is not satisfied with the fact and goes to the well of Ryugu-kozo. She sees Shino there and they lay bare their mind to the well. Though they accept that Naochika had a child woman with a "third woman", both of them have something against him and yell out their dissatisfaction towards him to bottom of the well (**). Then Takase becomes a daughter of the Iis and begins studying at Ryotanji with Toramatsu, Inosuke and NAKANO Naohisa. While studying, she notices Matsushita Jokei who visits Ryotanji and lookd away from him. Takase (centre) becomes a daughter of the Iis. Jokei informs that ODA Nobunaga acts in secret behind the Takedas who plan to invade into Suruga and TOKUGAWA Ieyasu has already allied with him. The New Year 1566 has come around and Masatsugu visits Sunpu to make New Year greetings. At that time Ujizane says that he will stop the Takedas in whatever way or manner. And SETO Hokyu who loses the chance of manufacturing matchlocks in Sunpu seeks a new field of activity and goes to Kiga, an autonomous city. (*) "Dai san no onna" is a parody of "Dai san no otoko", "The Third Man" in Japanese. 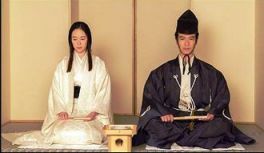 (**) It was not uncommon that a samurai had a relationship with a woman who was neither his wife nor concubine at that time. So the description is unnatural a bit in some way.